Herrin Township High School at Colp "Tigers"
Colp (population 224) is located in far southern Illinois in the northwest portion of Wiliamson County. Herrin Road is the main roadway through Colp. The town of Herrin sits just 1 1/2 miles east of Colp. The Little Hurricane Creek flows through Colp as well. Colp was established in 1910 as "Colpville." The town was developed by the John Colp Coal Company and named after its owner. A fan of the Glory Days site, Joe Dewees, advises that Herrin Township at one time supported two high schools for the children of the area. The photo at the top of this page was submitted by Colp High School Class of 1950 alum Ronald Kirby. Mr. Kirby states: :"(This is) a more recent photo of the old Colp H.S. 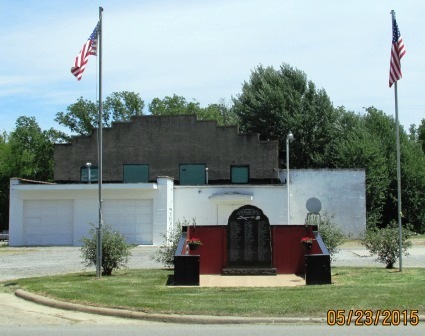 building including a newly painted front section and a monument of Colp/Dewmaine Coal Miners dedicated Labor Day 2013." Robert Pruter further advises that The high school in Colp was established for the African-American kids of Herrin Township. The school was technically a branch of Herrin Township High School. When the school was founded it was commonly called Dewmaine High, but around 1928 the name was changed to Colp High. 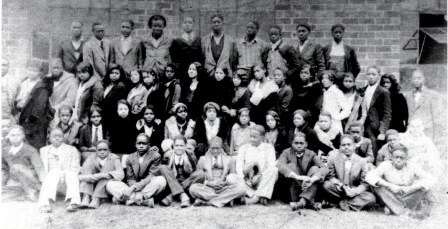 The school was segregated from competing with white schools and instead competed with the other black segregated high schools in Egypt, notably Cairo Sumner, Du Quoin Lincoln, Carbondale Attucks, Mound City Lovejoy, Mounds Douglas, East St. Louis Lincoln, Venice Lincoln, and Madison Dunbar. "HTHS @ Colp was closed in the spring of 1953 and the integration of Colp High School with Herrin Township High School occurred in the fall of 1953 before the Supreme Court decision. I was a freshman at HTHS in the fall of 1953 graduating in 1957. 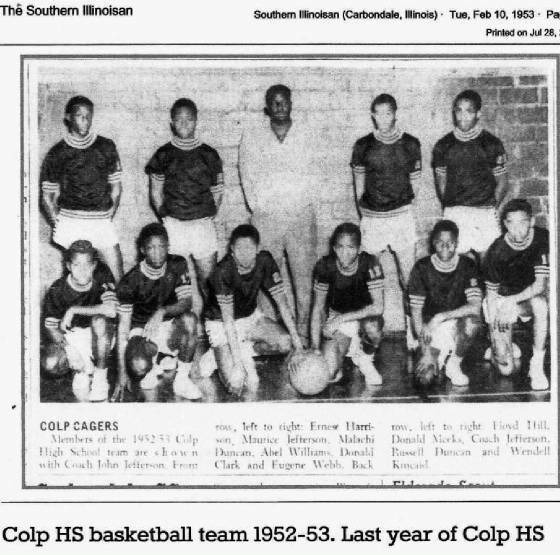 One of the incoming freshmen from Colp was Ivan Lee Jefferson who played on the HTHS basketball team which won the Illinois state championship in 1957. He was also president of our senior class." " My name is Ronald W. Kirby and a graduate of the Colp (Herrin) HS in May 1950. My first teacher and Basketball Coach there were Mr. Gaffney Taylor and his wife, Mrs. Derenda Taylor. My last teachers were Mr. Willis, principal, his wife Mary Willis and Mr. Cliffton Moore. Mr. Taylor was commonly called Prof Taylor at school and within the Colp community. So I will out of respect continue to do so in this article. During his tenure at Colp (Herrin) HS from approximately 1928 until his untimely death in 1947 there was no question of who was the head of Colp High School. Even in sports when there were other different coaches, Prof Taylor was regarded as head coach. According to Emanuel Duncan, a former student and classmate of members of the 1941 team, it was Prof Taylor who convinced star player Wm Riggins to stay in school his senior year rather than leave school to join the CCC Corp. According to Emmanuel, Prof was convinced that Riggins was essential for his team to have a chance against much bigger schools in the 1941 tournament at Herrin. After Mr. Taylor passed in 1947, Mrs. Taylor with her two young girls, Tony and Kay, took a teaching position in Carbondale. This was a sad day when she left. My personal experience with Prof Taylor started in the 7th grade. During the 7th grade our grade school did not have any male teachers and Prof took on the added responsibility of coaching the grade school team. We had another 7th grade classmate on the team named Ed White who was the nephew of Sam Webb. Ed, like his Uncle Sam, had a natural talent for the game and Prof assigned Ed as my tutor. Our first game was at Carbondale. We later played Duquoin and other grade schools. Ed and I played together for the following three years under Coach Taylor. In the following year 1945-1946, Coach Taylor took our grade school basketball team to a 2-day tournament of grade schools to Mounds, Illinois. Our team was very proud to come home with a 3rd place finish behind Carbondale and Cairo, two much larger schools. Most of our team members were also boy scouts under Mr. Taylor. The following summer, our Boy Scouts troop participated in our first camp-out competition in the Pulaski, Illinois area. Under the leadership of Scout Willie Duncan, we took pride in returning with a good share of ribbons to present to Mr. Taylor at his home. When I graduated in 1950, our school was down to approximately 24 students with 4 graduating, including myself, Ed McKinley, Stella Stover and Nadine Cooper. I was pleased to later learn our chemistry teacher, Mr. Cliffton Moore left his teaching position and eventually became a Medical Doctor in Virginia. Years later I got a 1931-1932 school picture (copy enclosed) of the Colp (Herrin) HS from my Aunt Armanda Kirby who then was a freshman there. Her late husband and my uncle Norvel(Tat) Kirby had attended and played on the Colp basketball team during the years 1934-1938. In 1931-32 & 1933-34 Colp was the SICCHS Runner-ups and in 1935-1936 were the SICCHS Champions. I remember how proud my uncle was to have played for Prof Taylor and graduated from Colp(Herrin) HS. The 1931-32 school photo revealed some interesting information. At the time the school had 50 students and 3 teachers including Mr. Taylor, Carl Lee and Evelyn Bower. There were 26 boys and 24 girls. One girl Izetta Brown Williams was one of the first students to attend high school in 1928 at Colp, walking 3 miles from her home in Cliffort, Illinois. She just turned 102 in July at Detroit and still has good health and memory of her old school. Next to Izetta is Helen Kelly. Helen was daughter of Lillian and step daughter of Hubert Russel and retired in Colp after a career as Professor at Purdue University. On the front row sitting side by side were two sons of Dr. A.W. Springs, Andrew, Jr. and Jimmy Springs who later became a noted singer and returned to Colp in 1944 for the doctor's funeral. A group of older boys stood on the top row in the order of: Clarence Kincaid, Sr. Richard Lewis, Ike McMahan, George Webb, Paul Brown, George Tyler, Charlie Wilson, Fred McCellan and Floyd Williams. It has been reported that Colp played a football game in 1928 as the Colp Colts against Murphysboro and were the SICCHS basketball Runner-up in 1927-28 and as noted above in 1931-32. It would appear that a number of boys on the top row were players in the football and/or basketball games during these years. Although the Colp (Herrin) HS continued to lose attendance from 1931 until it closed in 1953, I was told by Eugene Green that his 1941 freshman class started with a record number of 26 students but graduated only 3 including Eugene who married one of my class graduates, Stella Stover Green. One remarkable aspect of the 1941 freshmen class was the inclusion of William Hatchett, Jr. and after only 6 months at Colp (Herrin) HS he was a big impact player on the March 1941 championship team that defeated East St Louis. Hatchett brought to Colp High School the size and toughness that was so important in this win. It seems fitting that Sonja Williams Lancaster would end what her Aunt Izetta Williams started as a member of the first Colp (Herrin) HS in 1928, by being among the last students to close the Colp (Herrin) school and enter Herrin HS during the 1953-1954 year. She graduated in 1955 with over 150 other students. It is noted that William Williams was father of Sonja Williams Lancaster and E.J. Mayes was father of James Mayes of Colp and my grandfather. Rev. J.D. Davis was long term pastor of Mt Olive Baptist Church of Colp from 1918 until 1953. Sonja Lancaster provided information from the late Mr. Baker that he finished his grade and high school education as a straight A student and never missed a day of school in grade or high school. H.C. Passed in 2014 at age of 99. 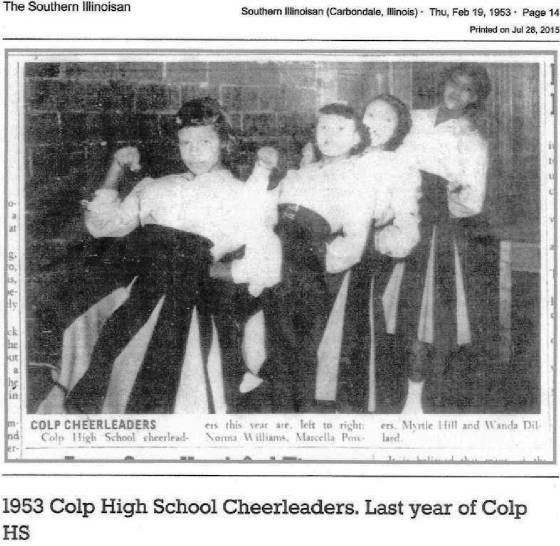 The following comments on the history of Colp High School came from Sonja Williams Lancaster who was in her Junior year at Colp HS when the transition of the Black students with the Herrin Township High School occurred. She brings a first-hand account of the Colp students involved and her perspective of how the transition was received. This is important from a historical standpoint because at that time the Black and White grade schools in Colp were facing an unknown integration possibility that caused hard feelings in both groups, especially the possibility that the White students from Colp would go to the Attucks Grade School in Colp. Therefore it was not unreasonable for some of the Black parents to be concerned of sending their children out of town. However only the students involved, as Sonja, had a personal reason to be apprehensive about how they would be received at Herrin. Sonja ends by revealing that these students were active in a wide range of extracurricular activities, sport and non-sport. Two divergent examples show that Ivan Lee Jefferson was very active in several top athletic events while Malachi Duncan concentrated primarily on student council and Drama club as his top activities. Throughout his four years at Herrin High School Ivan Lee exceeded in several sports. He was inducted into the Herrin HS Hall of Fame in 1996 and was one of the key players in the 1957 Herrin State Basketball Championship. Malachi after high school established a reputation as an excellent speaker during his management career at a major corporation and later as a retired, self-employed business owner. He was also known for his advice to youngsters of his 4 for 40 plan, which translated to four years of education for 40 years of life's reward. However overall it would be the girls that gained the most benefit from the many extracurricular activities they experienced at Herrin High School over very limited activities received by female students attending the Colp High School. The above information provided by Sonja Williams Lancaster is greatly appreciated. We are also sympathetic that at this time Sonja just lost one of her lifetime friends named Doris Brown Beck and offer our sympathies to the family of Doris who, with two other Colp youngsters including Deloris Jean Powers and the late Raymond Davis, Jr., were the first Black graduates of the Herrin High School. Written by Ronald Kirby in the interest of Sonja Williams Lancaster. The Colp High School building classrooms and gymnasium are still standing and in good use. What once was the Colp High School gymnasium is now used for storage by the city of Colp. .
Colp HS team nickname: "Tigers"
School Fight Song: "We're Loyal To You Herrin High School"
Colp High School boys competed in basketball, football, and track as a member of the Southern Illinois Conference of Colored High Schools (SICCHS). The school also competed in baseball. In Egypt Colp was limited to play against the other African-American public schools. Colp High's coach's names, and records of the better Colp teams are all items we are seeking. "I recently read an issue of the Murphysboro Daily Independent newspaper dated November 12, 1928 (p.2) with an article concerning the Veteran’s Day football game between the Murphysboro Douglas (sic) Maroons and the Colp Colts, won by Murphysboro Douglas (sic) by a score of 6-0. Over 300 spectators attended the game." We know athletics could not have been all of the functions offered at Colp High. It is probable that chorus, band, and other extra-curricular activities were offered as well. The Colp boys could hoop it up with some of the best in the SICCHS, taking home a tournament title in 1936 and finishing second on three other occasions. Names of coaches and players are needed, as are win-loss records. "Here (above) is the Oil Painting that now hangs w/ other State Champions pictures in the Herrin High School Gym. We were able to lift a picture from a Micro chip found in a March 1941 Addition of the Herrin Dally Journal ,.. found in the Herrin City Library History Room. We couldn't get it bigger than 20'' x 20''. We contacted Betty Jesse with the Little Egypt Art Association. She donated her labor . We purchased the Canvass and paid for an Apprentice to help her. We also donated the money for new flooring in their Art Gallery. The money was donated by Colp citizens and former residents. We had some money left, that was donated to the High School Art Department.The painting is stunning and is 4' x 5' it has the prime location in our Gym! The painting was presented at the 2012 Hall of Fame Sports Banquet. It was unveiled at a private gathering of Colp Citizens and Families of the 1941 HTHS @ Colp ISHAA Boys Basketball State Championship Team. .We had a large crowd prior to the banquet (est. 100 +) many came from out of state .The ISHAA ( w/2 A's) oversaw and conducted a " Colored State Tournament '' from 1928 -1948.Then it was was for all schools . The Chicago Black League waited another decade to join the rest of Illinois. In 1958 Chicago Marshall was the first league team to compete, The irony is that they defeated the 1957 State Championship Team. The defending State Champion was Herrin High. They also introduced to Illinois Basketball the " Run and Gun " style of play , from then on ...it has been " Game ON !! HTHS @ Colp closed in 1953 . Ivan Lee Jefferson would be on the starting five for the 1957 HTHS Team. He was the Senior Class President and the first Minority to play Basketball at University of Wisconsin. Willie Williams and Ivan had lead the Colp Black Grade School to the Southern Illinois grade school championship in 1952. Herrin desegregated a year before the Supreme Court ruling at the encouragement of the Tiger's Coach at the main campus, so the story goes. Willie was on the 1957 and 1958 Teams. Willie and Ivan were both an All American. Ivan and Willie were descendants of several members of 1941 Team that defeated e team form a city of 80,000 people. Herrin High School @ Colp had two class rooms , lunch room and Gym .This could have been the Black " Hoosiers " Movie." HERRIN - It's been Colp's best-kept secret all these years until now. 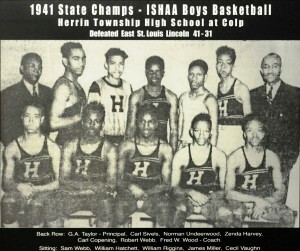 The 1941 Herrin Township High School in Colp was the state basketball champions of the Illinois High School Athletic Association, defeating East St. Louis Lincoln in the title game, 41-31. During halftime of Monday's game between Herrin and Salem in the 2011 Pyramid Pyramid Plus Boys Basketball Tournament at Herrin High School gymnasium, relatives and friends of players on that championship team were honored. A 20-by-24-inch picture was displayed, and fans were asked to stand and join in as the Herrin High School cheerleaders performed the Herrin Loyalty. There are plans to get the picture blown up to 4-by-5-feet and mounted on the east Herrin High School gymnasium wall. "I've been a Colp resident for 46 years and like most people in Colp now, we didn't even know this happened," said William Perkins. The fact came to light recently when Alonzo Willis of Colp produced a picture for local writers who were researching Colp history. Willis is the son of one of the team members who has since deceased - Carl Copening. "He (Copening) said they went all the way and won it. It was hard fought. They had to battle all the way," Willis said about what his father told him about that special year. When asked what it felt it like now to get the recognition that's been a long time coming, Willis said, "It feels good. I was getting all this information about what our ancestors accomplished and what they went through. It feels good to get the recognition." Robert Webb Jr. whose father Robert Webb Sr. and second cousin Sam Webb played on the team drove from Chicago to attend the recognition. "I don't remember him (Robert Sr.) talking about the championship," Robert Webb Jr. said. Sam Webb eventually returned to the area and coached Willie Williams who was a main cog on Herrin's 1957 state championship team. Williams' sister, Jackie Williams Ferguson of Marion was also in attendance. Her first cousins William Riggins and James Miller were members of that championship team. Dr. Lawrence Hatchett of Marion who received a basketball scholarship to play at Marquette University shortly after the school claimed a national championship in 1977, said he was unaware of his father, William Hatchett, playing on that state championship team. "They always said he was a great baseball pitcher. That's what everyone talked about. I didn't know much about this," Dr. Hatchett said. Other members of the championship team coached by Fred Wood were: Carl Sivels, Norman Underwood, Zenda Harvey, William Riggins, James Miller and Cecil Vaughn. Scores involving Colp High School participating in the IHSA State Tournament were located on a website titled "Illinois Postseason Basketball Scores." These scores are listed below. **Final high school basketball game for Colp High School. School consolidated with Herrin High School in the summer of 1953. The boys were also fast on the oval track, placing as the SICCHS runners-up in 1927 and 1928! An interesting fact is that those are the same as the white Herrin High School at that time. 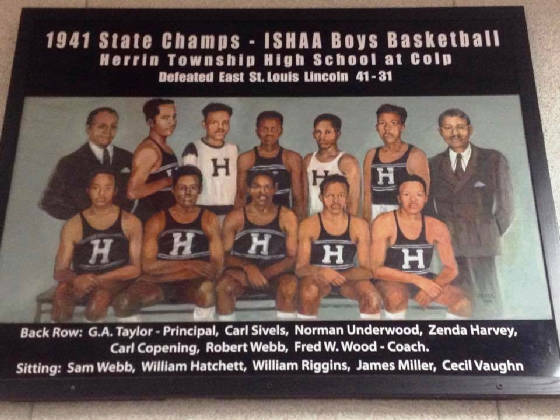 Also, according to Jim Gentile, a 4 ft. by 5 ft picture of the 1941 State Champion Colp team will be mounted at the current Herrin High School gym along side the Herrin High School 1957 IHSA State Championship team. As the picture notes, the capital "H" on the jerseys designates Herrin. The actual name of the school was HTHS (Herrin Township High School) at Colp and was the school that colored/black students were assigned to and attended until the fall of 1953 at which time they were intergrated into the main campus of the Herrin Township High School and the Colp campus was closed as a high school facility. The Colp High School campus was actually a satellite campus of the Herrin Township High School main campus. Both campusses were under the control of the Herrin Township High School Board of Education . Also, the fight song for HTHS at Colp, the Illinois fight song, used the term Herrin High School (not Colp)."